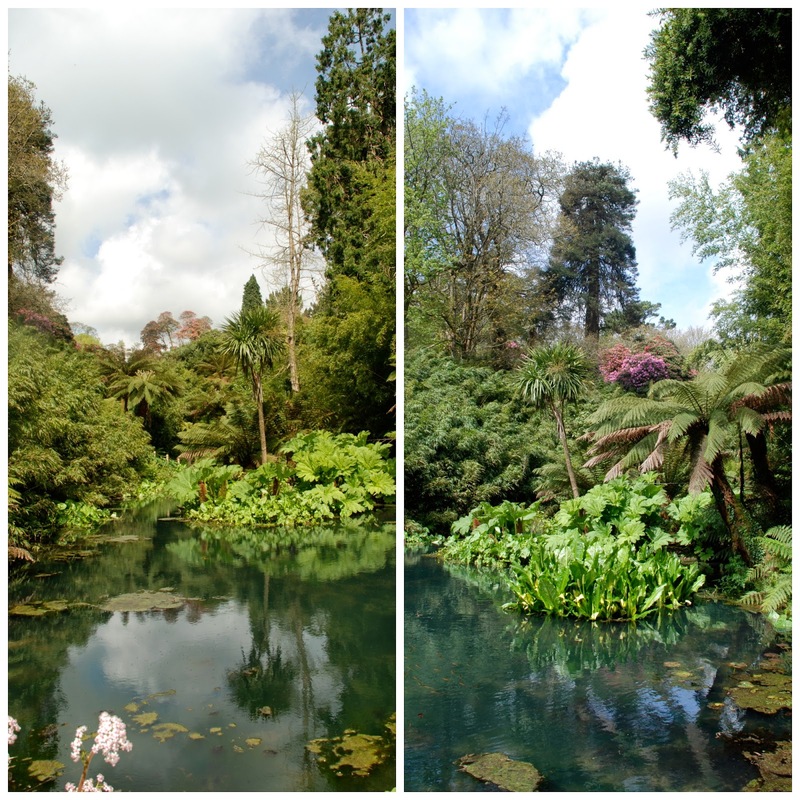 Last Sunday we took a trip down to Cornwall to visit the Lost Gardens of Heligan. They were exquisite, both in their prettiness and in their symbolism. In 2013 the Imperial War Museum registered the gardens as a Living Memorial to the fallen from the First World War. I can think of no better memorial to the soldiers who never returned to work the land, and to a way of life that was changed forever by the war. One of the things that I am coming to realise is that the First World War was a terrible, brutal catalyst for social change. You see in those days the junior officers, the first and second lieutenants and the young captains, who were in the trenches with their men, took special pride in leading from the front. They were the first over the top and the last to retreat. As a result the rate of attrition amongst these men was higher than for any other rank. For the most part they were drawn from the upper classes. In 1914 Lord Kitchener called upon the public school boys of Britain to officer his army, and, almost to a boy, they stepped forward and did so. The enemy snipers made it their priority to kill the officers first, and scoured the ranks to find them. Apart from their uniforms they were easy to spot: in 1914 the average public schoolboy, with his better diet and lifestyle, was on average 5 inches taller than his working class contemporary. On the Western Front these young subalterns had an average life expectancy of 6 weeks. During the blackest days of the Somme that fell to just 14 days. So, in effect, the aristocracy lost a generation of young men who would otherwise have inherited estates like Heligan, and all the other privileges that came with their rank. That inevitably created a sort of opportunity vacuum at the top end of society, making it easier for people of more humble origins to rise. Most of the Tommies came home from the war in better shape than when they'd left. They'd been fed army rations which, whilst being far removed from haute cuisine, were much more nutritious than what they'd have got back in Blighty. They'd been well clothed and strictly disciplined. They'd journeyed beyond our shores and were fitter and more confident as a result of the experience. Seeing what had happened in the war, lions led by donkeys and all that, they were more inclined to question the established order and all of this made them more aspirational than would have been the case if the war had never happened. In a very real sense the war empowered them to better their lot back in civilian life after they were demobbed. And then there were the women, who'd been agitating for the vote and for full political rights for years before the war broke out. After their contribution to the war effort, there really was no saying "no" to their demands for political rights. The genie was well and truly out of the bottle. I wonder how much longer it would have taken for women to get the vote if the First World War had never happened. Now, please, I'm not for one moment suggesting that the First World War was a good thing. It was a huge tragedy that the political classes on all sides were unable to sort out their differences and prevent it from happening. It was, without a shadow of a doubt, one of the darkest chapters in our history, and I am profoundly grateful that I did not live through it, and that the men in my life were not exposed to the unparalleled horror that was life in the trenches. All I'm saying is that the war changed much more than the political map of Europe. It fundamentally changed the fabric of our society. Here at Heligan, they recognise the outbreak of the First World War as the day our world changed forever. Why was that? 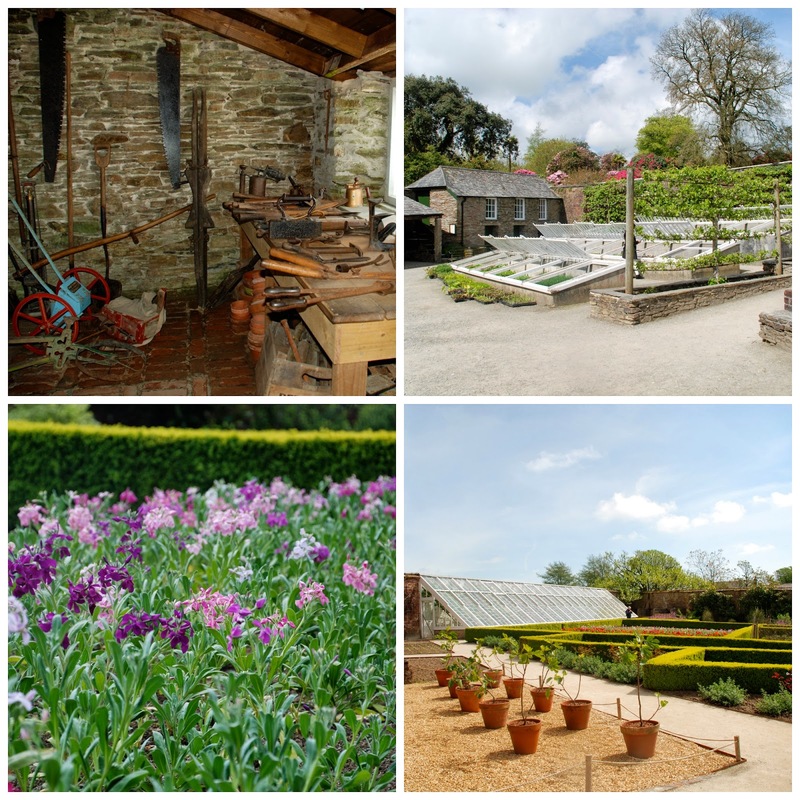 What great change did the distant war make to the gardens of Heligan? Well in the first instance the able-bodied men between the ages of 18 and 38 slowly drifted off to fight. The wages records show fewer and fewer people being employed to look after the gardens as the war progressed. The squire, John Tremayne, fought with distinction as a member of the Royal Naval Air Service. The house was turned over to the Military who used it as a convalescent hospital for wounded officers. Squire John survived the war, but found it impossible to live with the ghosts at Heligan after his home was restored to him. By 1923 he had taken himself off to live abroad, and the house and grounds were in the hands of tenants, and slowly, slowly the gardens began their sad decline. They became more and more forgotten, overlooked and uncared for. This carried on until the 1970's when the house was redeveloped as flats. By that time they had slipped into total neglect and obscurity. Nature took over, and they disappeared into the undergrowth. Then one day in 1990 Tim Smit and John Nelson, the two men who were to pioneer their restoration, discovered the old Thunderbox Room, the gardeners' outdoor toilet. On the wall they noticed some graffiti. Someone had written Don't come here to sleep or slumber and below the others had signed their names and added the date August 1914. The two men were electrified by this direct contact with the folk who had worked there all those years ago and then gone off to fight. They vowed, there and then, that they would restore the gardens to their former splendour as a living tribute to those who had once made them great: the ordinary people who had worked the land, rather than the grand types up in the big house. And great is exactly what they've made them. I liked that there isn't a big house visit as part of the ticket. My whole inspiration in coming here had been to find out about the workers who had made the gardens, and their successors, the people who had been inspired to re-make them. 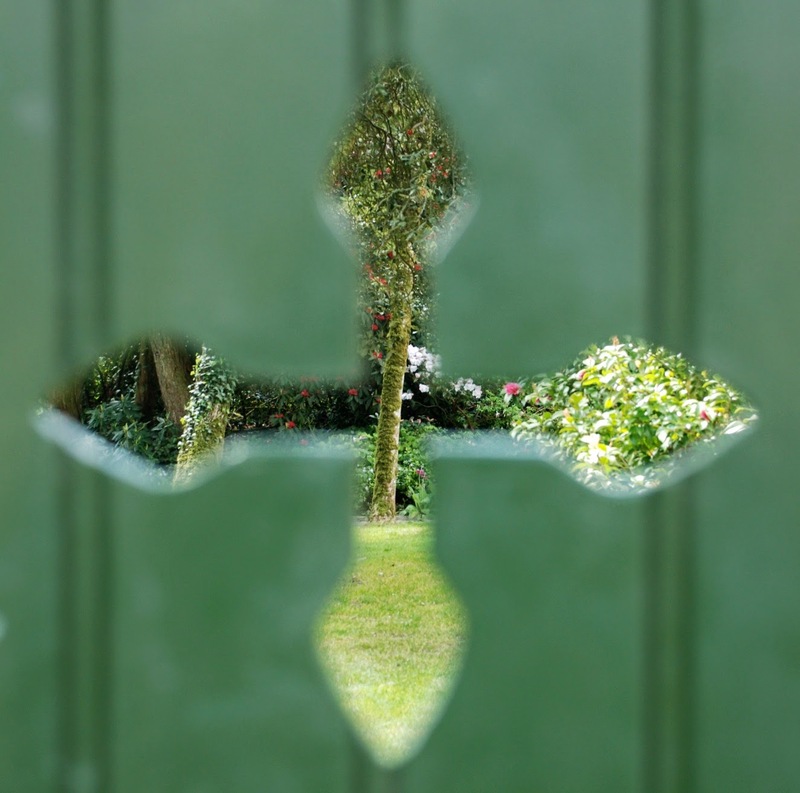 There's something inherently magical about the mystery of a lost, forgotten garden, and a big house tour would only have been a distraction from the real business of the day. 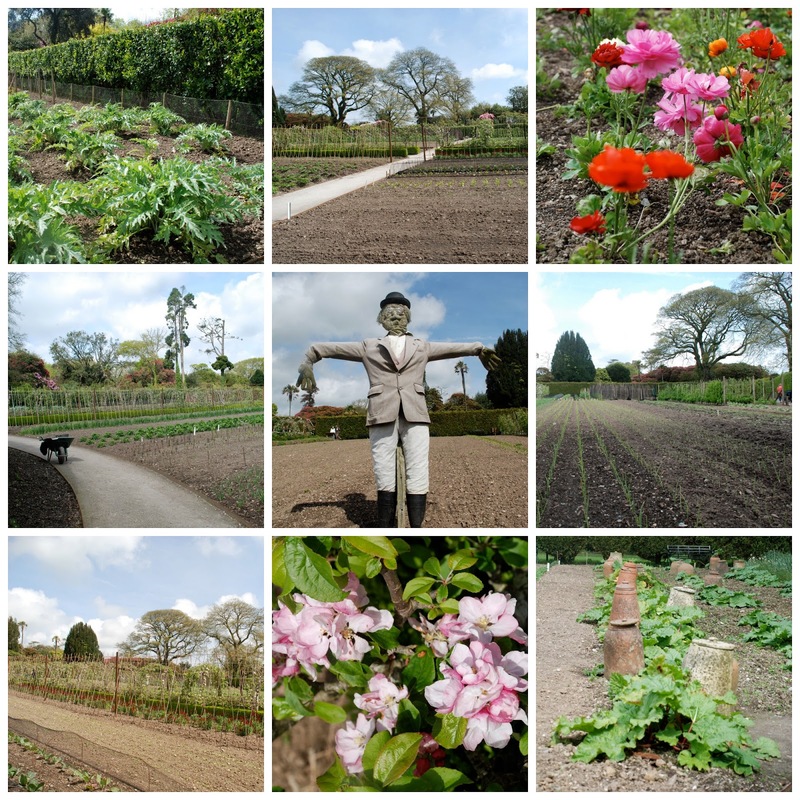 The kitchen garden and the walled flower garden are a triumph of functionality and design: all perfectly ordered with a Victorian sense of place and purpose. They've been growing melons, bananas, citrus, grapes, peaches, figs and pineapples in glass houses here since the early days of the nineteenth century. Those hothouses are now restored and back in production. The pineapple pit was a thing of wonder. They use fermenting horse manure in subterranean trenches to generate the heat needed for the pineapples to grow. 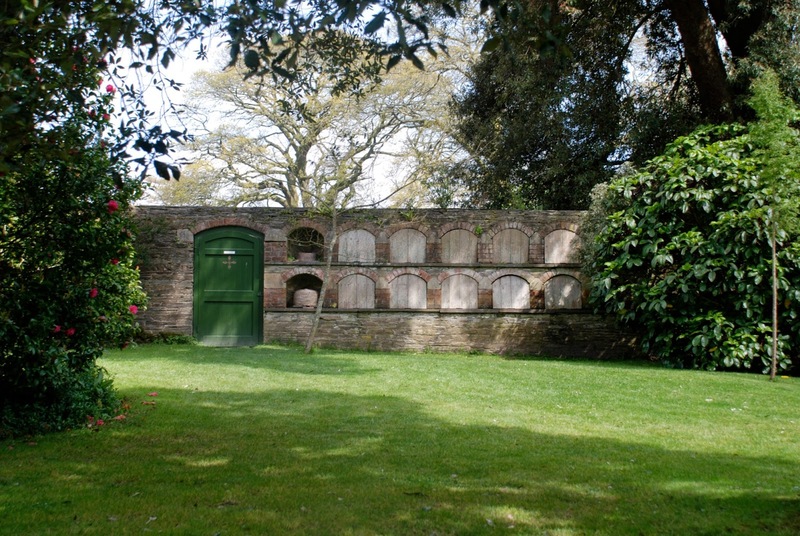 I especially liked the early Victorian Bee Boles, built into the wall of the vegetable garden. They hold two rows of barley straw keps, in which the bees live. They help to pollinate the crops in the gardens as well as providing wax for candle-making and honey. 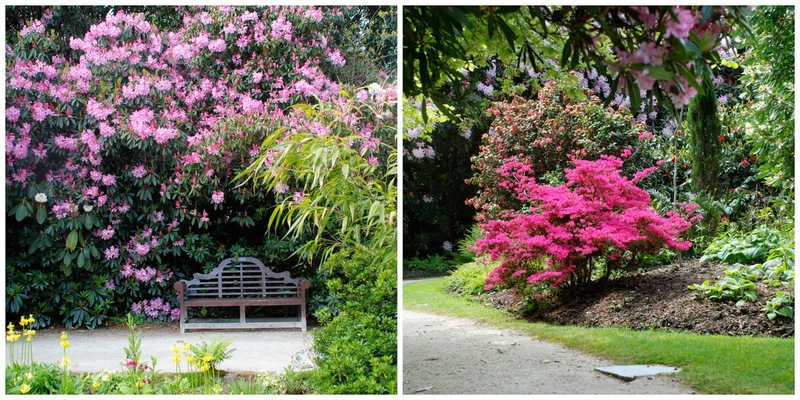 The gardens are home to the National Collection of Camellias and Rhododendrons introduced to Heligan pre 1920. 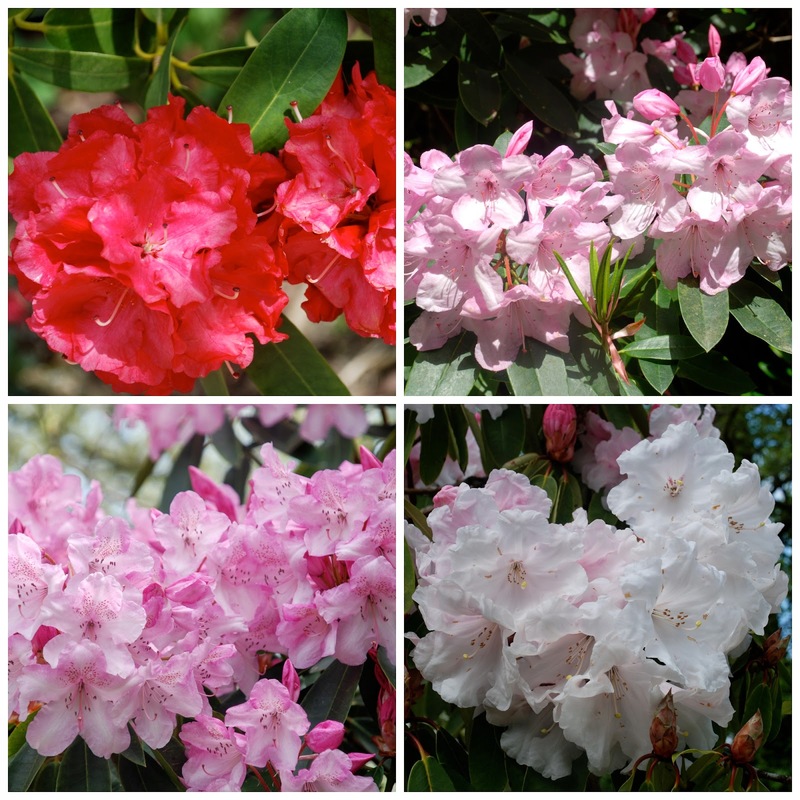 On Sunday the rhododendrons were in full bloom. They were glorious: great, large trees covered in flowers, with carpets of fallen petals in the cavernous spaces beneath their sprawling limbs. I have fond memories from childhood of hiding beneath the arms of a huge rhododendron tree that grew on my grandparents' lawn. The leaf canopy stretched all the way down to the grass, and it was possible for a little girl and her dog to disappear without trace, which must have exercised my poor grandma's patience from time to time. It's a strange space beneath a rhododendron tree; foreign and quite different from any other part of the garden. These trees are so huge, you get a sense of them having been here forever. 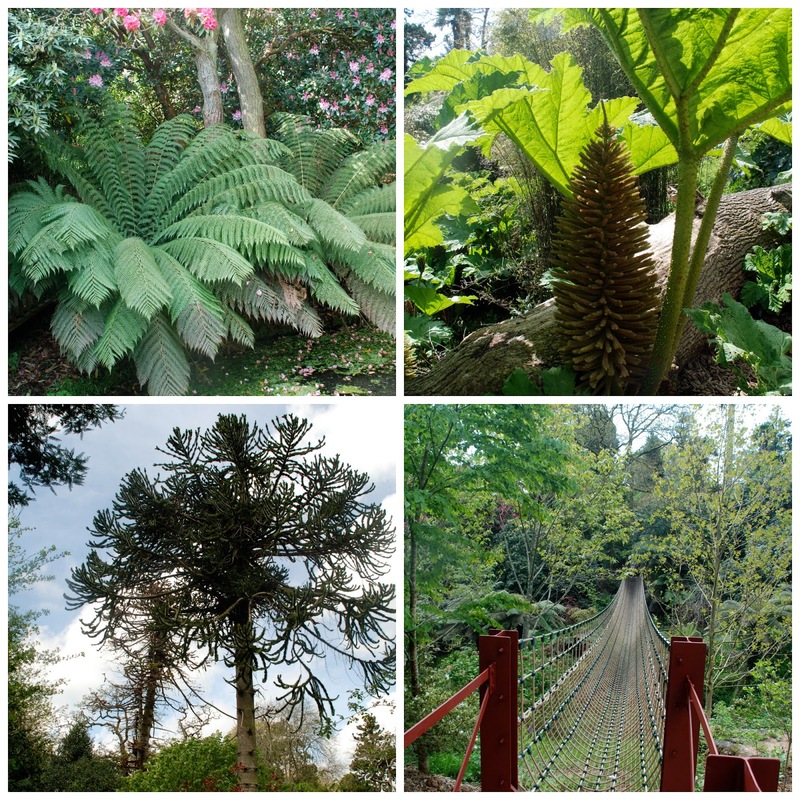 Indeed some of the earliest rhododendrons to reach our shores (from Joseph Hookers' Himalayan trip to Sikkim in 1851) are still growing happily here at Heligan. This exoticism continues in the Jungle, an eight acre garden in a steep-sided, south-facing valley with a micro-climate all its own. When you descend into the jungle you're conscious of things heating up. It's normally several degrees warmer down there than in the surrounding gardens. It was laid out one hundred and thirty years ago with plants collected from around the world back in the days when botany and collecting plant specimens were just kicking-off as fashionable pursuits. It really doesn't look much like England. 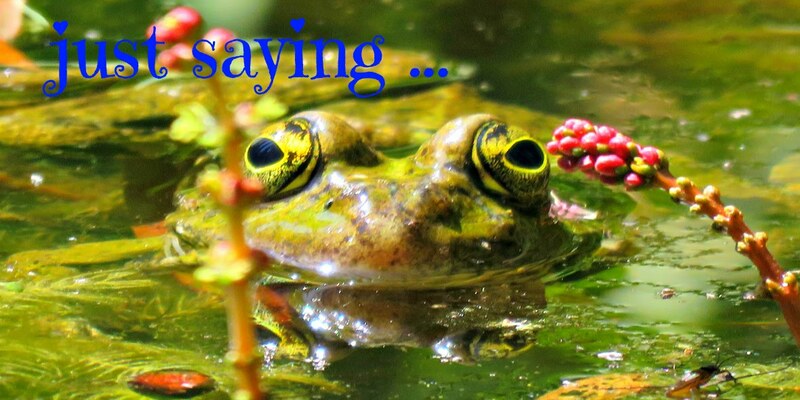 I was greatly tickled by the idea of Victorian guests trooping around in their top hats and tails, crinolines and parasols admiring the lush vegetation. I wonder what they made of it. Maybe the old hands who'd been out in India or who'd fought in the Boer Wars regaled the others with anecdotes about the last time I saw a plant like this ... . I'd love to be able to listen back through time to the stories they told and the reminiscences they shared whilst they wandered around. We carried on from the jungle to the Woodland Walk, where I was especially delighted to see lots of bluebells as I've been suffering from a bit of a bluebell fixation recently. 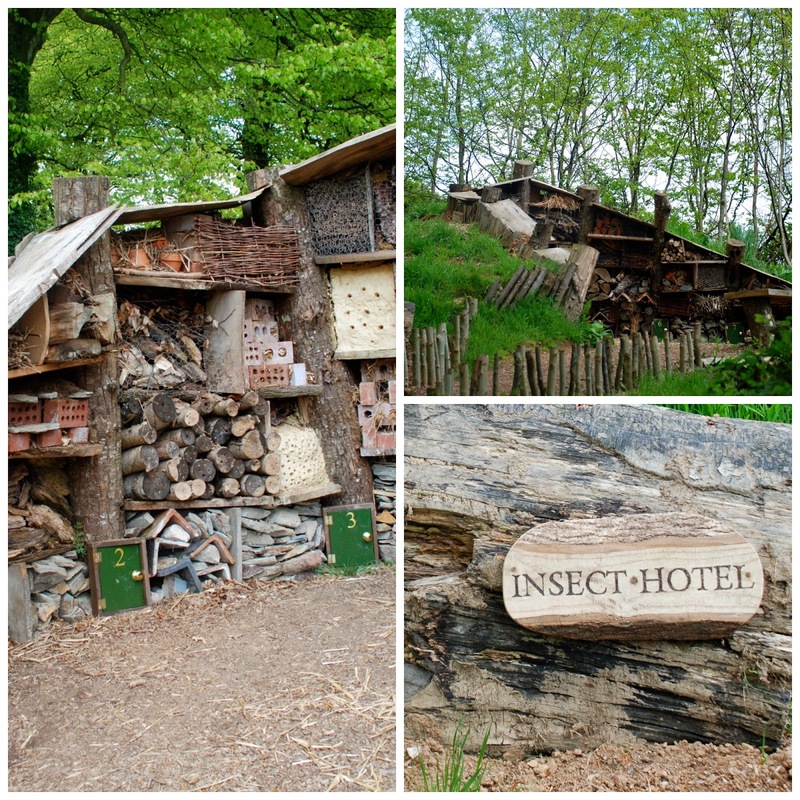 Emi, my son, was very taken with the Insect Hotel - or Bug Hotel as he preferred to call it - which is a really groovy place for all the creepy-crawlies to hang out. We were all impressed with the wonderfully contemporary woodland sculptures. For me they reinforced the point that time has marched on, and we are no longer living in 1914. The gardens have survived to be enjoyed by another generation, who are, quite rightly, leaving their own marks and embellishments on the landscape. Below is the giant's head. 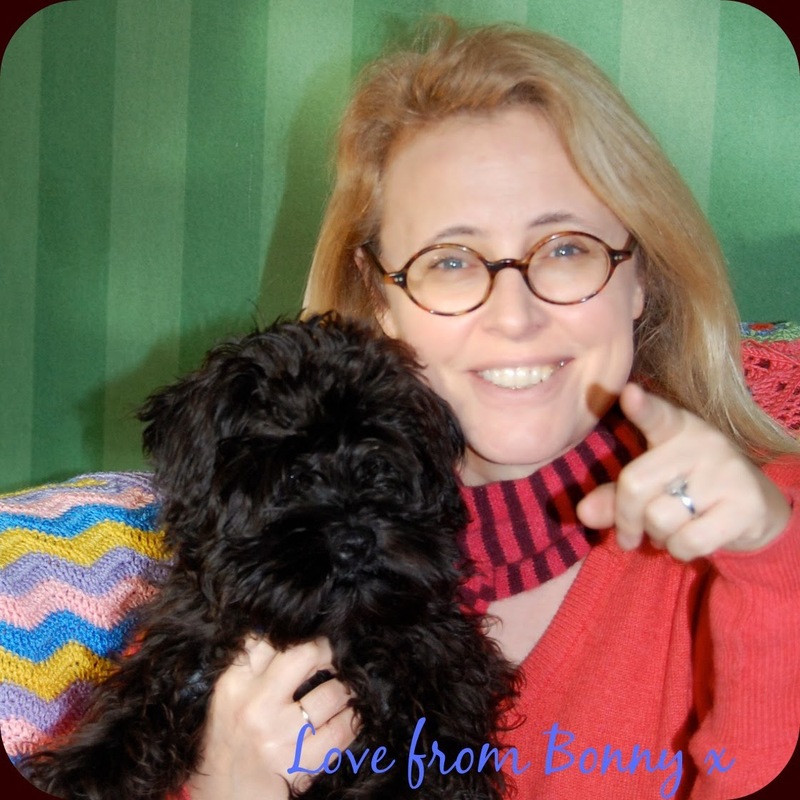 He's a very benign, cheerful-looking sort of a giant. 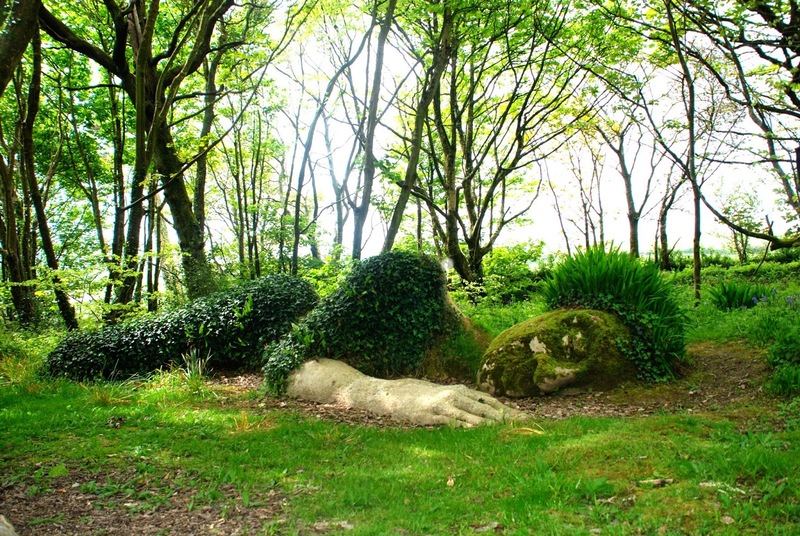 And this is the mud maid, who looked very peaceful as she lay asleep in her woodland glade. 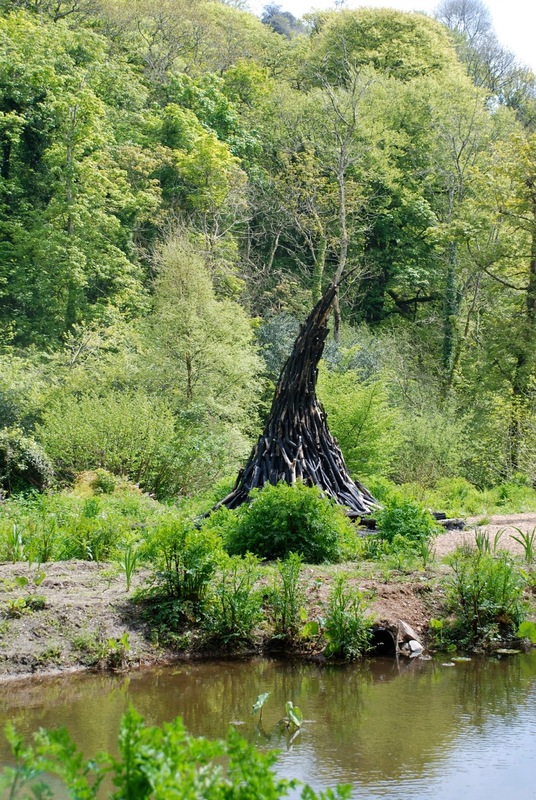 This is the charcoal sculpture, down in the Lost Valley, which was designed to symbolise growth and decay. For myself I'd have made that growth, decay and regeneration, which is really what these gardens are all about. Beautiful photos! So sad about so many young lives lost. How awful war is.